Welcome to FutonBedsFromJapan.com's first Futon Blog post. You know, we spend roughly half of our lives sleeping. Most Westerners spend that time two feet off the floor in a bed with a mattress on a box spring. That being said, an ever increasing number of non-Japanese are discovering the advantages of sleeping a little closer to the earth on a futon. However, we have to draw a clear distinction between so-called "Western style" futons (manufactured for the Western market) and authentic Japanese made futon that you will find in Japan. Hi I'm Dean Fuller, the creator of FutonBedsFromJapan.com and I've lived in Japan for over six years now. Aside from the occasional night spent in a hotel somewhere, my wife Yumi and I have slept on an authentic Japanese style futon since the first night I moved to Japan. In September of 2007 I made my first visit to Japan. At the time I was looking for an "authentic Japanese experience" so instead of staying in hotels I found a website that specialized in Ryokan (Japanese style hotels) and guest-houses (essentially what Westerners call "bed & breakfasts"). 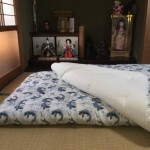 To be honest, because I had owned a Western style futon before, though I was very open to experiencing something new, I was less than optimistic about sleeping on the floor on a futon in the Ryokan. But I soon discovered that I had nothing to worry about as it quickly became clear that authentic Japanese futon had absolutely nothing in common with those lumpy, monstrosities called "futon" that sell in the West. The futon shops in my hometown of Sacramento, CA may have said they sold "futon" . . . but the word "futon" is where all similarities ended. I won't go into details here as I've created a whole series of videos you'll find on the FutonBedsFromJapan.com home page, but my first month traveling through Japan staying in Ryokan began my love-affair with the Japanese . . . and the Japanese futon. Your Sleep Needs are Very Individual . . . Comfort Factors Aside . . . Comfort aside, futon are also fantastically convenient when used as daybeds and guest beds as well. They're easy to set out, clean and store away. Once again, welcome to FutonBedsFromJapan.com, take your time to check out the videos in our buying guide and discover why our futons are nothing like what you'll see made in the Western market. This entry was posted in futon on April 26, 2015 by Y Hasegawa.